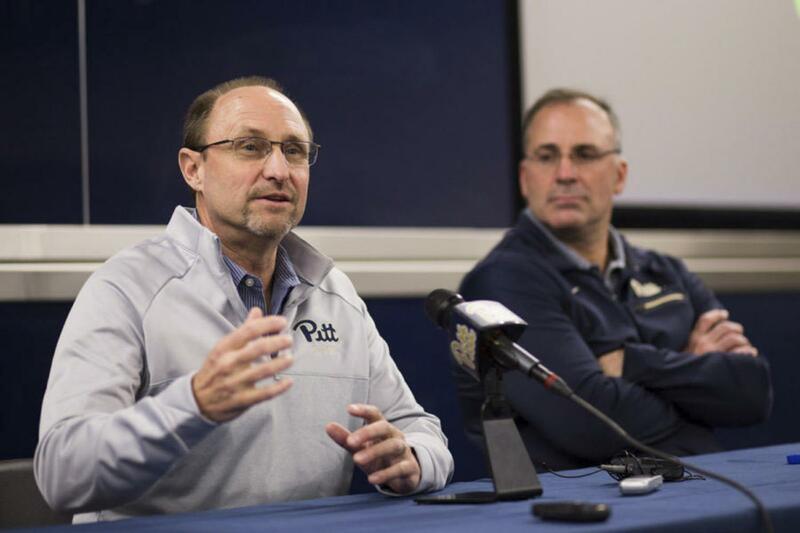 When Josh Conklin left the Pitt football program to become the head coach at Wofford, Pitt head coach Pat Narduzzi had to find someone to replace the long-standing assistant — and quickly. Narduzzi called on an old friend to fill the position. Randy Bates was officially introduced as Pitt’s new defensive coordinator at a press conference Friday, Jan. 19. Before that, he spent the last 12 seasons as the linebackers coach at Northwestern. “Besides the last 12 years at Northwestern, and playing against each other about every year at Northwestern, Randy and I go back to when he was at Louisiana Tech and I was at Northern Illinois,” Narduzzi said. The two continued their relationship as coaches in the Big Ten, with Bates at Northwestern and Narduzzi at Michigan State. Narduzzi also said he would call Bates earlier in his career to discuss the games each coach had the upcoming week. Bates’ hiring comes on the heels of a season that saw the Panthers finish 69th overall in the country in total defense, a statistic that measures the average yards per game a team gives up. With Bates’ pedigree as a defensive coach, finishing last year at Northwestern ranked 34th in total defense, the Panthers will be looking to improve on their underwhelming 2017 campaign. While Bates isn’t from Pittsburgh, he grew up close to the City in Zanesville, Ohio — just two hours from Pittsburgh by car. He spoke highly of the city, mentioning that he and his parents would make trips to Pittsburgh when he was young. In a Jan. 19 interview with the Post-Gazette, Bates said he would collect Iron City beer cans during those childhood trips to Pittsburgh. He remembers getting autographs from former Pittsburgh Pirates legends like Willie Stargell and Roberto Clemente. But it wasn’t just the city that attracted Bates. At Northwestern, Bates worked under head coach Pat Fitzgerald, who worked as a defensive coach before taking over Northwestern’s head coaching position 2006. Like Fitzgerald, Narduzzi comes from a defensive background, which was important to Bates when he made his move to Pitt. Bates inherits a defense that will return nine of its 11 starters from last season, as junior defensive back Jordan Whitehead and senior defensive back Avonte Maddox go to the NFL Draft later this spring. In his first year at Pitt, Bates will have to make improvements across the board to match the legacy he leaves behind in Chicago. Northwestern finished ninth in the country in rush defense last season — only allowing an average 108 yards per game with Bates in charge of the linebackers. Pitt was 41st in the country, with an average of 142 yards per game allowed. Along with its stout run defense, Northwestern was great in high-pressure situations, finishing 10th in red zone defense efficiency. Pitt, in comparison, finished 21st in the country. Bates will also inherit 10 new defensive recruits for the 2018 season, including John Morgan, a three-star defensive end from Dematha Catholic in Hyattsville, Maryland. And Bates said he is looking forward to working with players like Morgan — at the press conference, he seemed ready to fully immerse himself in Pitt football.